Saraki received salary as governor till August 2015—Witness - BlogIT with OLIVIA!!! However, Kwara State government, in a swift reaction, denied paying the former governor salary after he left office in May 2011. Furthermore, Abdulwahab Isa, the Director-General of Abubakar Bukola Saraki Constituency Office, otherwise known as Mandate, said the Senate President does not have access to his pension account, which is dedicated to helping students across the state. At the CCT sitting yesterday, a star prosecution witness, Mr. Michael Wetkass, who is a Detective Superintendent with the Economic and Financial Crimes Commission, EFCC, told the tribunal that investigation revealed that, whereas Saraki’s tenure as governor of the state ended on May 29, 2011, he stopped collecting salary on August 31, 2015. Wetkass was the head of a three-man crack team that investigated six separate petitions that culminated in the 13-count criminal charge the Senate President is facing before CCT. The charge preferred against Saraki by Federal Government borders on false/anticipatory declaration of assets, operation of foreign bank accounts while in office as governor and allegation that he acquired wealth beyond his legitimate earnings. At the resumed sitting yesterday, the witness told the tribunal that as at September 16, 2015, when the Access Bank Plc account Saraki used for his governorship salary and pension was closed, it had a debit balance of N599,091.63, and that the account had a balance of N52,372,417 as at June 3, 2015. 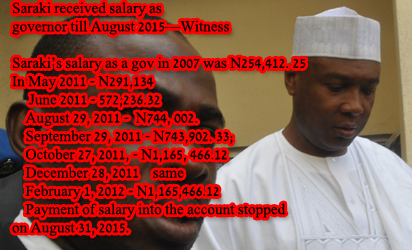 The witness said investigations revealed that Saraki’s salary as a governor in 2007 was N254,412. 25; N291,134 as at May 2011, and increased to N572,236.32 in June the same year. saraki-salaryHe said: “On August 29, 2011, there was another payment into the account by order of Kwara State government for N744, 002. “On September 29, 2011, the salary was N743,902. 33; October 27, 2011, N1,165, 466.12 and the same amount was also paid to the defendant in November and December 28, 2011. “The same N1,165,466.12 was paid to the defendant as salary on February 1, 2012. Payment of salary into the account stopped on August 31, 2015. “Funds that entered into this account was from the Kwara State government. The salary and pension that was later paid into the account, the balance as at June 3, 2015, was N52,372,417. “On June 3, there was a transfer from the account in the sum of N25 million to Guarantee Trust Bank, GTB, leaving the account in debit balance of N2,628,632.39. There was also debit transfer of N30 million to GTB from this salary account of the defendant in Access Bank. Giving a chronological account of financial activities of the defendant, the witness said: “There was N10 million cash lodgement by Abdul, who was personal assistant to the defendant. On March 24, 2005, there was another transaction by the same Abdul to the tune of N8.24 million. On March 29, 2006, there was transaction of N200.640 million in favour of Implementation Committee on the sale of government properties. It was a bank draft. “On the same March 29, 2006, there was also credit disbursement of loan in favour of the defendant to the tune of N200 million, which preceded the bank draft. On the same day, there was another loan disbursement of N380 million from GTB. “On the same day, there were two bank drafts compiled in one transaction for the sum of N256,312,815, in favour of the implementation committee on Federal Government landed property. On October 16, 2005, there was another draft of N12,815,000, in favour of the implementation committee. “The bank drafts were meant for the purchase of properties from the implementation committee by Saraki. On February 5, 2007, there was another disbursement by GTB into the Naira account, of N380 million. “On February 27, 2007, there was cash deposit of N3 million by one Josiah Samuel, while on April 3, 2007, there was a telegraphic transfer of N180,675,000. “According to the narration in the account, the transaction was on instruction of the defendant in favour of the Presidential Committee, as part payment for a property. “On September 18, 2007, Ubi made cash deposits in five tranches on the same day into the same account in GTB. The sums are N11 million, N20 million, N20 million, N20 million and N6 million. The total amount was N77 million. “Before the lodgements were made, the account had a debit balance of N81,960,289. On November 22, 2007, there were cash lodgements into the account by Abdul Adama in 50 different transactions, totalling about N45 million. Before the lodgements, the account was in a debit balance of N80,210,976.70. “On November 29, 2007, there were cash lodgements by Ubi, in over 20 transactions and the total sum is about N20 million. “On March 14, 2008, there were several cash lodgements by different individuals. Before then, the account had a debit of N96,857,885.17. “On April 18, it was the same thing; there were cash lodgements by various individuals. On September 23, 2008, the same thing happened; there were several cash lodgements by different individuals with different names. “On April 30, 2009, there was a draft in favour of BGL Assets Management Limited for N400 million. On same day, there were also several cash lodge-ments by several individuals.